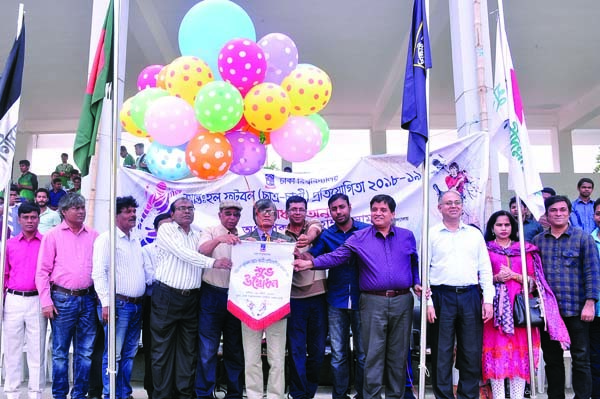 Pro-Vice-Chancellor (Administration) of Dhaka University (DU) Professor Dr Muhammad Samad inaugurating the Inter-Hall Football (Male Students & Female Students) Competition by releasing the balloons as Chief Guest at the Central Playground of DU on Tuesday. President of Dhaka University Football Committee Professor Dr Shah Md Masum presided over the inaugural ceremony. Provosts of different halls of DU, Residential teachers, Sports Secretary of DUCSU and officials of Physical Education Centre of DU were present on the occasion.